Jacqueline Louise Fuchs, popularly known as Jackie Fox or Jackie Fuchs is an American attorney and former musician. She used to play bass guitar for the popular teenage rock band, The Runaways. She joined the band in 1975, before turning 16. She left the band in 1977. Later, she worked as an entertainment attorney to the actors, directors, producers, writers, and authors. She has participated and won Jeopardy. The former rock band, The Runaways bassist is killing it as she has already won three episodes of "Jeopardy!". On the first episode on 14 December, she became the new champion, managing to win $14,200. She defended her crown as she won the second game of "Jeopardy! ", where she collected $19,889 on Monday, $34,089 in total. She again emerged as a winner of "Jeopardy!" on Tuesday, when she correctly identified the artist behind "Call Me Maybe", Carly Rae Jepsen, and won $12,200, earning a total of $58,689. She was the bass guitarist of the popular teenage rock band, The Runaways. Jackie Fox was born as Jacqueline Louise Fuchs on 20 December 1959. She was born in Los Angeles, California in the United States. She holds American nationality. Her father is David Anthony Fuchs. The identity of her mother is not available. She has a sister named Carol Fuchs. Her zodiac sign is Sagittarius. She attended University of California, Los Angeles, where she joined The Runaways. She completed B.A from UCLA in Linguistics and Italian, with a specialization in computing. She earned J.D. from Harvard University. Barack Obama was one of her classmates. She joined the rock band the Runaways, while she was at the University of California. Initially, she auditioned for lead guitar, However, she was later chosen to play bass. She officially joined the Runaways at the age of 15, in 1975. Fox did not play at her band's debut album, The Runaways. She played on the band's second studio album, Queens of Noise. In 1977, Fox appeared on the band's Live in Japan tour. She left the after recording their new album based on their tour in Japan. Although she had already left the band, she appeared on Flaming Schoolgirls in 1980, and on the compilation albums, Neon Angels and The Best of the Runaways. She appeared as contestants on the Dating Game circa in 1980. In 1994, she played bass at the Runaways reunion. After leaving the band, she worked as a record promotion executive, as a modeling agent, and as the promoter of Tony Robbin's Firewalking seminars. She co-wrote the script, "Delilah's Scissors". She also appeared in the 2005 documentary film Edgeplay: A Film About the Runaways. In 2013, she appeared as a contestant in the fourth episode of The Chase. She also appeared as a contestant on the syndicated version of Who Wants to Be a Millionaire? where she won only $1,000. Currently, she works as an entertainment attorney representing actors, writers, directors, producers, and authors. 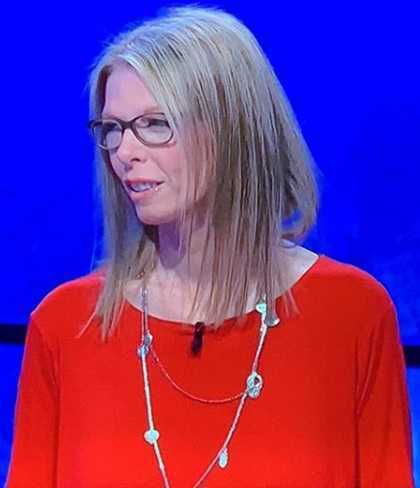 In December 2018, she appeared in Jeopardy!, where she has already won first three games as of 18 December. She is the sister-in-law of Martin Shafer, co-founder of Castle Rock Entertainment. She revealed in July 2015, that she was raped by her ex-band the Runaways' manager, Kim Fowley on New Year's Eve 1975 at an after-party following the band's performance at an Orange County club. At the time, she was just 16 years old. Fowley allegedly raped her in the presence of her band members. Other band members never denied about the incident not taking place but deny their presence at the time of the incident. Jackie Fox stands at a height of 1.74 m i.e. 5 feet and 8 inches tall. Other information are currently unavailable. As an attorney, she represents several actors, directors, producers, and writers. She earns the most from her law firm. As of 2018, the net worth of ex-the Runaways bassist is estimated at around $2 million. Fox was a merit scholar admitted to UCLA, to study mathematics. Fox speaks French, Italian, Spanish, and Greek as well. Barack Obama was one of her classmates at Harvard. She did not permit her name to be used in the 2010 Hollywood feature film The Runaways. A fictional character, Robin was created as the band's bassist. Darby Crash of a punk rock band, the Gems dedicated the song, "Suicide Machine" to Fox. Fox has written for the Huffington Post blog.